SMS Marketing Vs. Social Media: Which Is Better for Business? In today’s world, there is cut-throat competition in all fields of products and services. With many companies selling comparable quality of products and services, the one that wins are the one that gets its message across to the maximum number of target customers. Needless to say, SMS Marketing came into being much before social media marketing, and even today it holds a good position as an effective means of marketing. Although more and more people are turning towards the social media sites like Facebook, Twitter, Snapchat and others, the efficacy and the ease of using SMS marketing vs. social media are much better even today. 93% of adults in the UK alone own mobile phones and regularly check their text messages. Of course, it can be argued that even social media platforms can be accessed on smartphones but if you look at the statistics defined by Shopify then 98% of text messages are checked within 3 minutes, and the average click-through rate is 36%. This is the reason that many businesses are using hyperlinks in their text messages. On the other hand, a Facebook post has an average reach of about 2%, and only about 11% readers engage with that post. At the same time, there are about 100 million active users on Twitter, but only 29% of the posts on Twitter are read. If you compare SMS vs. social media, then you will realise that the learning curve of social media is very steep. It takes a long time to understand the algorithms of Facebook and other social sites, and they keep changing at a rapid rate. This makes it difficult to keep up with the social media marketing. The investment required in building up a social media presence is also considerably larger. Then again, once you have created a profile, it is not advisable to abandon it because this will create a bad impression. With social media, you constantly have to be on your toes and generate relevant messages which the readers will engage in. 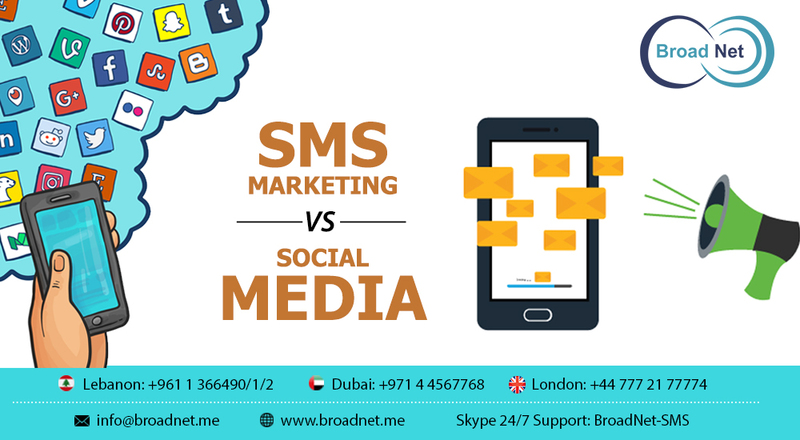 Another comparison between SMS marketing and social media is that the potential of SMS is much more than social media due to the massive number of mobile phone users across the world. Smartphone users usually check their phones more than 150 times a day, and 86% of themobile phone users check their phone within one hour of waking up. Again, According to Shopify , the highest conversion rate among all social ecommerce traffic is held by Facebook at 1.85%. On the other hand, the conversion rate with the help of SMS marketing best practices has reached approximately 23%. This data is for retailers who use promotional text messaging and include a limited time in which the customer can redeem an offer. These promotional text messages include in them a strong call to action which motivates the target customers to get up and place an order immediately. This type of instant reaction in a positive manner is quite difficult to achieve with social media which includes lengthy conversations and much convincing on the part of the marketers to make the target audience motivated enough to take action. All said and done, text messaging services for businesses wins hands down when compared to social media marketing. Not only is it more cost-effective compared to social media marketing, but the result of motivating the target customer to take action is also more effective with SMS marketing. People are more likely to read text messages than they are to read promotional messages on social media sites.This is the reason that a majority of businesses still rely on SMS marketing compared to the much-hyped social media marketing to grow their businesses.